"What's going on here?" Amy crossed her arms over her chest and glanced back at the farmhouse, at the shiny truck in the driveway. "That's a new truck, isn't it? That's not a classic." "And the apple tree--and the summer days..." Amy's eyes clouded with emotion. "You're not from here," she murmured. "No. No. It can't be. This isn't possible." Amy backed away from him, backed all the way through the empty field, watching him while she vanished into the mist like a ghost. Fleeing an abusive boyfriend, Amy moves in with her great-aunt Mae, sharing the small trailer and beginning her junior year at the small rural high school far from home. Mae, who never married after her fiance Joe died at Iwo Jima, gives Amy the space to find her way, and a kind local boy, Jackson, tries to draw her into school activities, but Amy is a girl hoping to leave her past life behind but having no hopes for the new one before her. Then, chasing Aunt Mae's dog in the nearby fields, Amy's curiosity is drawn to a deep mist in the woods at the edge of the field, and pushing through the strangely deep fog, she finds a clearing where she meets a boy resting in the shade beside an old rotary push mower. A compelling friendship soon develops between the two and they begin to meet in their place often. But Henry is a boy, the only one in his family, who realizes that they are living in a cocoon of suspended time, in a life with a past but with no future, only a recurring and inescapable present. Gradually the situation unfolds to both of them. Henry sees that the time loop began when his mother received a telegram from the War Department, notifying her that his brother Robert was missing in action in the war in the Pacific. Fearing for his mother's sanity and health, that night Henry prays that the feared future, with the news of Robert's death, will not come and finds himself in a world in which it is always early June of 1944. Days are always sunny and warm and the new apples never ripen there, but soon, as Henry and Amy fall deeply in love with each other, they realize they are from two different times, and together they must find different futures in which Henry can live out his family's and his own future in his time. 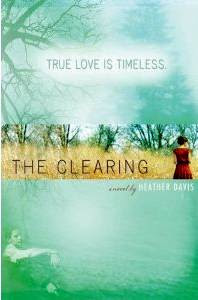 Although Heather Davis' The Clearing (Houghton Mifflin, 2010), shares a supernatural element with the current run of teen vampire and werewolf romances, the similarity ends there. A novel romance of great sweetness and poignancy, this one successfully builds parallel worlds, both of which seem as real as the young lovers who try to move between them. Avoiding an easy ending in which the two discover a way to be together through time, author Davis yet finds a believable way for Henry to change Amy's own life for the better in a final proof of his love, an ending in which true romantics will be satisfied and the novel's theme of timeless love remains uncompromised.